I was wanting to hold off on an update until I had something a little bit better to report. But that is not the case right now. After 4 air enemas failed to correct Scarlett's condition, she had to have surgery last night (5:00 - 7:30 p.m.) The doctors had to remove 6" of small intestine that was now dead and also her appendix. 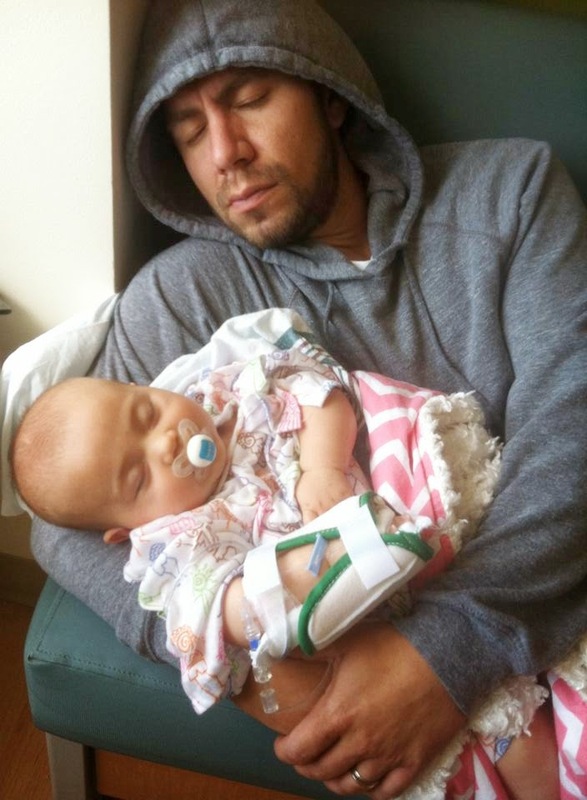 They discovered that she had a rare disorder called Meckel's Diverticulum that only 2% of children are born with, and it is more common in males. Now that this has been taken care of they are needing her to have a normal bowel movement. Once that happens, Andrea can feed her. Then she must not vomit. If she vomits one more time they are going to have to put a tube in her nose. Neither of these things have happened yet. She is in alot of pain which they are trying to control with Morphine and Tylenol. Her bottom is in sad shape from the enemas, her throat is irritated from all the vomiting and having a tube down her throat during surgery. My poor daughter-in-law is at an emotional breaking point having to see her baby in such anguish and she can't do anything to make it better. She said Scarlett looks at her with these sad eyes and she fears that Scarlett is ready to give up like her little body just can't take anymore. This just broke my heart. Still praying for a breakthrough. Something. I cannot begin to express my appreciation for your prayers, encouragement, caring and kind words...this has really lifted me up as I am just emotionally exhausted. Just as they are watching their baby suffer, I am also watching my kids suffer. Thank you for continued prayer for Scarlett. Praying for all of you, especially for Scarlett to get better! Oh, so sad. Prayers are still being given for Scarlett's recovery. My heart goes out to your family. Thoughts and prayers for all of you especially for little Scarlett. Praying, praying, PRAYING for that SomeOne to take care of your little Scarlett - and her Mommy and Daddy and YOU too! Praying for precious Scarlett and your whole family. Remember those little ones can be so resilient & beat the toughest of odds. Prayers continue for all of you. Please keep up the faith. God is watching over her! It makes me cry as well to think what that precious little girl is going through! Thanks for the updates and I pray tomorrow will be a better day! So sad Terry. I'm praying for Baby Scarlet and your family. So sad Terri. I'm praying for little Scarlet, you and your family. Prayers going up Terri! God watch over you all! I am lifting many prayers to you and your family. I can't imagine how awful this may be on all of you!!! May God wrap His arms around each of you and provide you with His comforting peace, and especially over little Scarlett. May God's hands provide a healing touch for this precious little girl. May God fill each of you and Scarlett with strength and courage to not give up. And just as our own children can come to us when they are tired or hurt, that same love can be found in the arms of our God. I like to imagine crawling right onto His lap and into His arms, and let that love melt your fears away. Beings that we are all stamp lovers here, I love the words "when life gets too hard to stand--then kneel. Such simple words but speak so much truth. Thank you for the updates. Yes, it is very hard to watch your family struggle, to have pain, fear and running on empty. Our God is great. Scarlet has made it through so much and praying the doctors are optimistic that surgery was a success. May you each feel His presence and each passing moment bring her closer to being healthy. Continued prayers for all! Praying for you, precious baby Scarlet and your son and DIL. I can only imagine the pain an fear all of you are going through. I asked for prayers for her at church Sunday. Will continue to pray for healing. As has been said, our God is Great, is watching over Scarlett and your son and daughter, he is hugging you and giving you strength! It is so very hard to watch the ones you love suffer! I will join all in continuing to pray for all of you and for the medical people who are caring for Scarlett! A diaper rash cream that I found to be really helpful (and I tried so many!) is Penaten-http://www.amazon.com/Penaten-Cream-Cr%C3%A8me-Large-Ounce/dp/B004H5GD6E/ref=sr_1_1?ie=UTF8&qid=1406596023&sr=8-1&keywords=german+diaper+rash+cream. You can't buy it in stores but this is the link on Amazon. I am still praying for Scarlet and the family. I can only imagine how heart breaking it is to see one so little go through so much.May God be with you all. Terri, I continue to hold all of you up in my prayers. I know all of you are in our Savior's loving hands! Oh tears come to my eyes just seeing these pictures and thinking about all your family is going through and especially precious little Scarlett! I'm praying that everything will happen that needs to happen and that the Drs will be given extra wisdom in how to best treat her from here! Praying for you all, that God ministers to your hurting hearts with a sweet comfort and peace. #1 on my prayer list Terri! Continuing to lift up your family in prayer. I have been so touched by what is happening to little Scarlett and all the shockwaves amongst your family. It must be so anguishing for you all, and so awful to see such a gorgeous little baby girl in pain and having such tremendous problems. I don't really know what to say except that I am thinking of Scarlett very much and hoping, hoping, hoping for some better news. 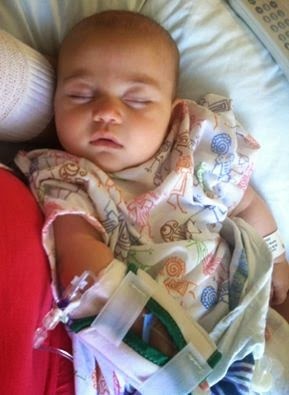 Prayers still flowing for little Scarlet, her family and yours...she is so precious. Oh Terri, I have little baby Scarlet in my prayers...she is such a beautiful sweet baby, please keep us all posted....I see that she is in Riley Children s hospital, besides God's hands she couldn't be in better hands, they are fantastic people there, I had a granddaughter treated there when she was 18 months old (she is 20 now) hugs to you and praying for your family!! Terri, I know you are suffering along with your son and his wife. What a terrible thing to endure. I am still praying for Scarlett and her family. You are certainly in my prayers, too. I am so sorry to hear about this. I have been praying and will continue to pray for all of you. Saying prayers for Scarlett and all the family. God bless you and your family. Praying for healing for baby Scarlett and strength to get through it all for you baby son.